The Gunpowder River is flowing at 80 CFS is 48F and clear. The trails are in great shape and the wading is getting easier as water levels have been slowing dropping through the week. Tiny BWO’s, small cream midges, small caddis larva and streamers have resulted in a few fish this week. Capt. 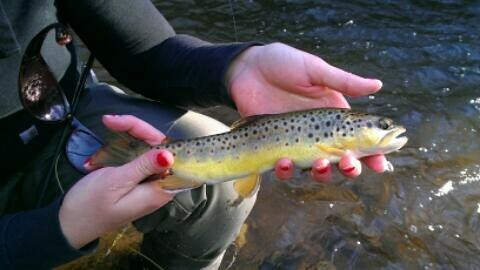 Jeff Lewatowski sent this nice shot of a wild fish Megan released above Falls Rd. The lower river below the confluence of Little Falls at Bluemount Rd is actually a bit warmer than the mainstem and a good bet for streamers. Wild Turkeys have been spotted along the river below Monkton and in a short drive mid-morning through the rolling countryside along the river I spotted a Bald Eagle, a Red tailed Hawk, a Coopers Hawk and a Kestrel. Wild fish have been holding along the edges and long leaders ending in 6x or 7x really help this time of year. Deep soft weight, shot and thingamabobbers have just arrived in the shop. When water temperatures drop, nymphing using a high stick method really pays off-remember to add enough weight to be able to “feel” the nymph rig and shot bouncing on the bottom before adding the strike indicator. Don’t make long casts. Often staying within a rod length or two of the area is more efficient and effective. Keep the line tight to the indicator, rod tip up and parallel to the water and do expect to get hung up on the bottom when using the right amount of shot-shoot for one or two out of ten casts as a good ratio. This entry was posted in fishing report on November 26, 2012 by Theaux Le Gardeur.